Biologists from the University of Leicester have discovered that one of nature's most important pollinators - the buff-tailed bumblebee – either ascends to the status of queen or remains a lowly worker bee based on which genes are 'turned on' during its lifespan. The paper, entitled 'Reproductive workers show queen-like gene expression in an intermediately eusocial insect, the buff-tailed bumble bee Bombus terrestris', which is published in the journal Molecular Ecology, suggests that the development of an individual bumblebee into its designated caste of male, worker or queen depends on the activation of individual genes, despite the bees all sharing similar genomes. The study is part of student Mark Harrison's PhD thesis and was supervised by Drs Eamonn Mallon and Rob Hammond from the University of Leicester's Department of Biology. It is the first time the whole genome exploration of caste differentiation has been carried out for the buff-tailed bumblebee, Bombus terrestris, which is now possible due to the recent sequencing of the entire bumblebee genome. 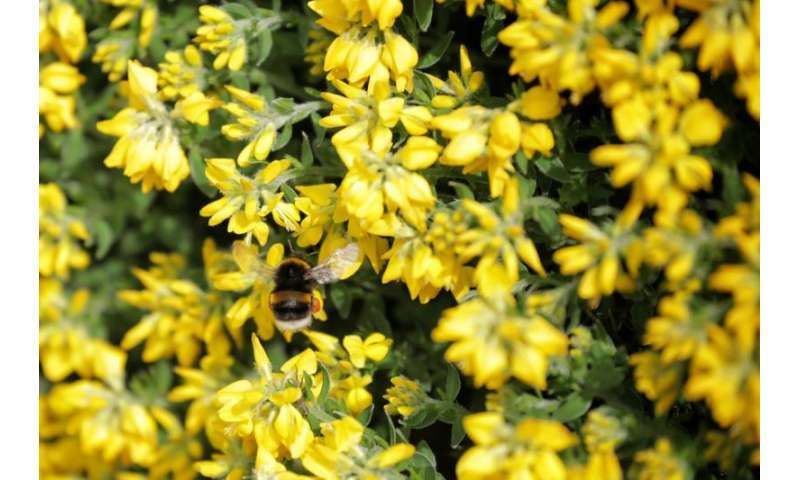 Mark Harrison explained: "The bumblebee is one of the most ecologically and economically important pollinators. One fascinating aspect of its biology is the differentiation of developing females into either workers or queens. "In our study we had the aim to understand how one genome could produce three such different castes - queens, workers and males - within bumblebees. "The question we sought to answer is how the genome encodes for males, workers and queens, as they are so genetically similar yet so different in behaviour, morphology and physiology." The team analysed which genes were 'turned on' in males, workers and queens of the buff-tailed bumblebee at different developmental stages to understand how the same genomes can produce such different castes. The findings suggest that differentiation is not caused by inherited genetic difference, as is typical of most species of animal, meaning that males, which hatch from unfertilised eggs, are genetically very similar to their sisters. Mark added: "One interesting finding was that the largest differences in gene expression were detected between adult castes rather than between castes within larval or pupal stages. This is surprising since all morphological features are developed during these two developmental phases. "This indicates the need for more distinct expression patterns to control behaviour and physiology in adults compared to those required to create different morphologies. "This was further highlighted by the patterns we observed within adult castes. The largest difference was found between the queen and males, whose behavior and physiology show little overlap." The differentiation between the castes in bees is similar to cell differentiation in humans, who also have a single genome encoded for all cell types. Each cell in the human body contains identical DNA, yet they differentiate into very different cell types, such as liver cells or neurons. Queens and the reproductive workers, which begin laying eggs towards the end of a colony cycle, also showed little difference in their gene expression patterns. Reproductive workers appear to become more 'queen-like' in their behaviour and physiology. In the future, the researchers hope to find out whether or not a different version of the same gene can lead to a female developing into a queen rather than a worker and wish to better understand how expression patterns are inherited in animals.